Guitar lessons in Glasgow for beginners and kids FAQs. Guitar lessons from myself have brought joy and music to over 500 happy students since 2004. Working together is the safest, guaranteed choice for quality, value lessons. No need to worry if you’re getting the best, most experienced tutor – you get Glasgow’s proven, most in-demand tutor who provides a service no-one can match GUARANTEED. What types of music do I teach? What steps are involved in booking lessons? How can I be sure I’m getting the best value – how much are lessons? Guitar Lessons from myself are £20 per lesson, but how do I compare to others? I provide lessons at your home – no-need to travel, fight traffic, contend with bad weather or pack up your family! How long is the guitar lesson and is the lesson long enough? What is the location of Guitar lessons and where are lessons given? I teach exclusively in the West End of Glasgow + Bearsden only. [Jordanhill, Scotstoun, Hyndland, Kelvindale, Kelvinside, Bearsden, baljaffrey, Milngavie, Westerton etc]. Lessons are super convenient – given at your home: again, no-need to travel, fight traffic, contend with bad weather or pack up your family! Whichever music your child want to learn is what I teach. The basics and technique I teach are all aimed towards playing the music your wee-one loves. From Ed Sheeran to Iron Maiden to AC/DC to Katy Perry – I teach my many students simplified versions of their most favourite tunes! 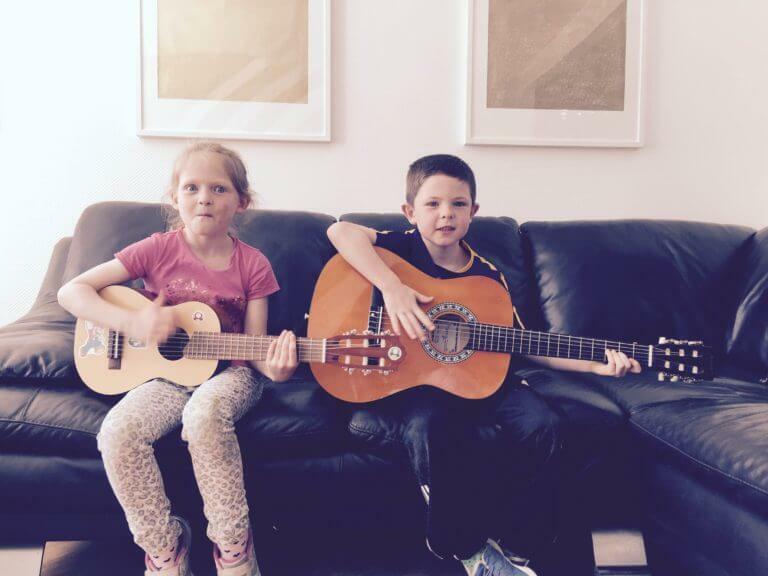 I teach children to enjoy and have fun on guitar – no boring theory, classical music or songs they don’t like. I don’t teach musical grades such as ABRSM guitar grades, Rock School, or RGT guitar exams. Find out why by reading my article on the subject here. I can provide guitars from my store, the WestEndGuitar shop here, or give impartial advice on purchasing from a source of your own. For children – Nylon strung Classical guitar, 3/4 or 1/2 size. Avoid toy guitars. See my article The Perfect Guitar for Lessons for more on what to go for. For an in-depth explanation of the process from contact to first lesson and everything in between, check out the ‘process of booking lessons’ page here. Have any questions which aren’t answered here? Leave a comment below, contact me (Paul) on 07468 515 992 – more options on the contact page here.